We all love to unwind after a long day and sometimes we just need pampered and to make ourselves feel good. From the comfort of your own bathroom, here are 5 key trends which will inspire that refresh you’ve been meaning to do and relax your mind and body. Imagine having a luxury spa experience without the price tag. This type of bathtub will be the main attraction of your room. The tub shape (oval, circle, rectangle and over-sized) will depend on the size and shape of your bathroom and these of course look especially extravagant in a larger space. Placing this in the middle of your bathroom will instantly create a sense of indulgence and remind you to have some YOU time. Enjoy every minute of it! This is the CABRITS bathtub by Victoria and Albert. 2. Space, Lots of Space! 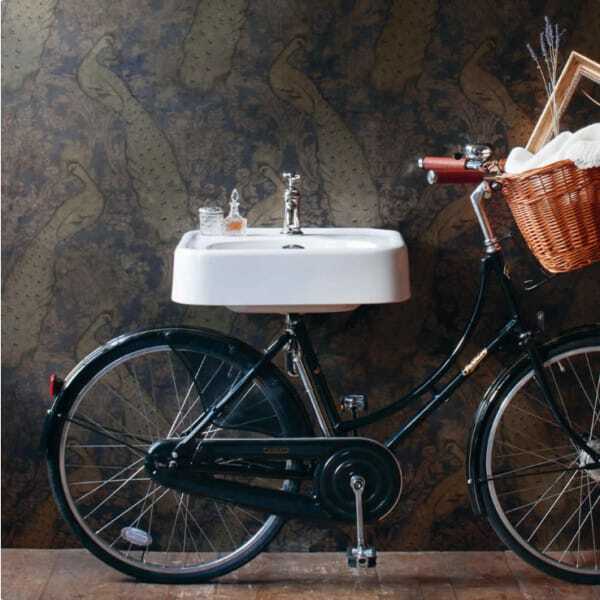 Style your bathroom according to the space that you have. Create minimalist looks by adding chic but simple accessories to your haven such as candles, rugs, towels and artwork. Opt for sleek, cohesive fittings and storage to avoid unnecessary clutter. Co-ordinate a tight colour palette, balance textural elements and highlight the best features in your bathroom, after all, it is your sanctuary. A few accessories can reflect on relaxation and wellbeing. 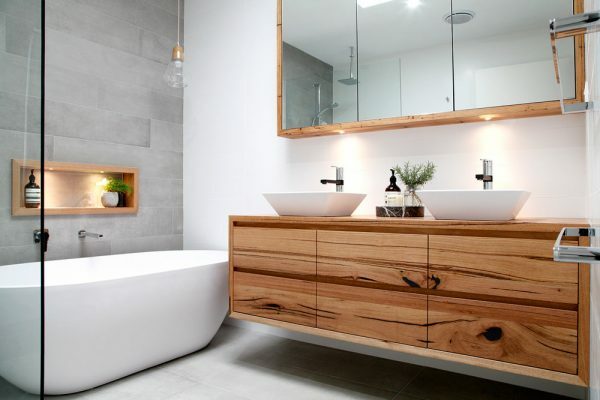 Transform your bathroom with natural and organic elements by adding solid timber and veneer finishes in the form of furniture and co-ordinated accessories. This is one of the most hotly tipped looks for 2018. Think of a log cabin effect within your own four walls. Bringing in additional decorative elements such as plants will create the sense of bringing the outdoors in. Made and scaled finishes will help with the wet and humid conditions which are found inside the bathroom. A timber finish on the sink area gives this bathroom a radiant, natural feel. Graphic patterns and 3D expressions are the types of tiles that will make your bathroom stand out. Various shapes, prints and geometric forms on different surfaces such as matt and glaze can transform your bathroom into a modern day retreat for those days where you need an escape from reality. A feature wall is at the heart of any room and choosing a bold tile to set apart from the rest of the room will show character inside the room. With the bathtub featured next to it, the slate wall is the main feature in this luxurious room. Mirror Mirror On The Wall, this is the finest room of all! With the correctly styled piece for your bathroom, a statement mirror can give the illusion of space by making use of natural light and draw attention to a wall (if there’s not a feature wall already.) This show-stopping lightbulb mirror is the focal point of the room and creates a truly glamorous feel with an industrial edge. or you can browse our website! This entry was posted in Baths, Community, Showers, Style, Uncategorized and tagged Bathroom, Bathrooms, Baths, Edinburgh, Edinburgh Showroom, Perth, Showers, Showroom, The Bathroom Company.